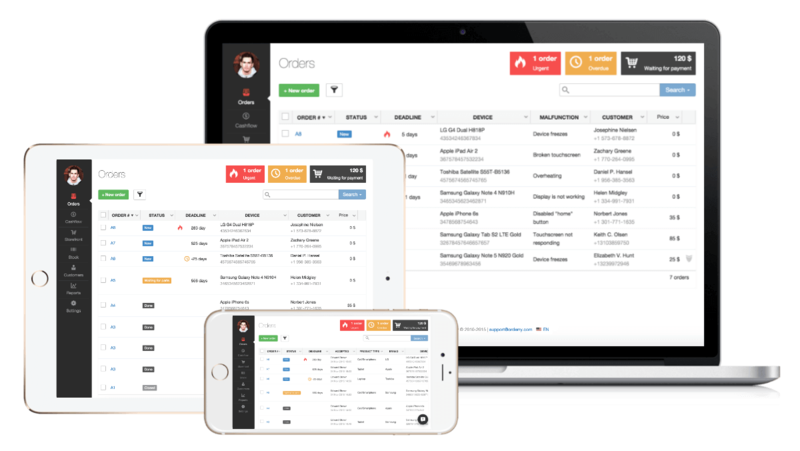 All tickets and customers in one place, financial accounting, sales, inventory, SMS notifications. Orderry is ideal for any size repair service handling anything from bicycles to computers, washing machines to smartphones. Intuitive interface, the program runs without programming, 14 daysfree for testing. Save up to 20 minutes per ticket - 33 hours per 100 tickets! Create a variety of templates and print them out right from your browser. Install our application on Andorid smartphone and get a full-fledged call center in just 5 minutes! Saves all your customers automatically and allows to export them to Excel. You can view online in real time when and which employees have created tickets, made sales, or deposited payments. Keep accurate records of merchandise and spare parts in stock, easily keep track of product sales. Each time a ticket is completed, the customer is notified automatically via SMS and the manager receives a status update by email. We are constantly improving our product! Learn more about the latest features. Your connection is protected through HTTPS over an SSL secure channel. All your business information is stored in a highly secure, world-class data center. Now you never loose your data – system automatically creates a backup copy of your account every day. All your personal and business information is kept strictly confidential. Orderry is a cloud-based service that requires only an Internet connection. View reports and monitor your staff's activity on any device, anytime, anywhere. Automatic sending of SMS-notifications of acceptance and readiness of the order. Notification of appointment for employees as responsible for the tickets. Pay for 20 months and get 6 additional months free. Pay for 10 months and get 2 additional months free. Pay for 5 months and get 100 text messages free. More than 250 employees or 50 workshops? Not a problem contact us.